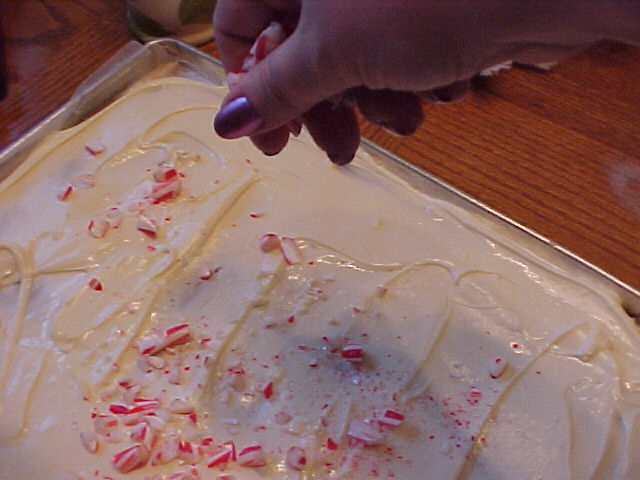 Peppermint Bark is a wonderful treat to give friends for the holidays and you'll be amazed at how simple (and inexpensive) it is to create! 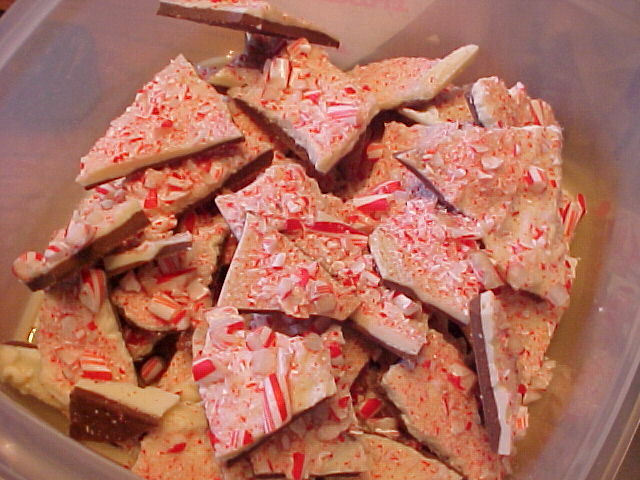 Of course, you could go to a fancy store and pay $20 for a pound of peppermint bark or you can pay $6.75 for two pounds and have the fun of making your own! 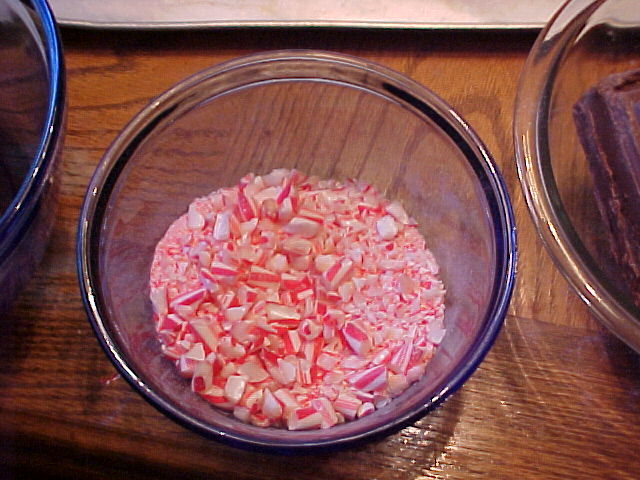 Christmas 2007 Note: I created this version a few years ago because a very high-end housewares store gave me a sample of their $19.99 per pound peppermint bark and I thought that I should be able to make it for less. I had success from the first try, so I posted my version on the website. 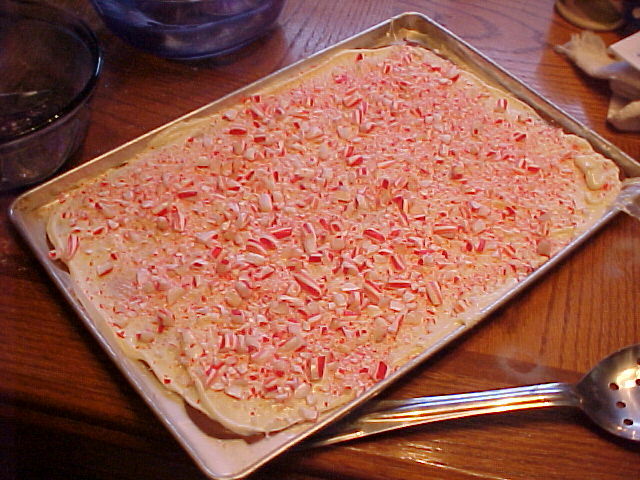 Thanks to this recipe, and all the other people who had the same thought and "Googled" peppermint bark, I've had to increase this site's bandwidth several times and for the first couple of years the site would routinely crash the day after Thanksgiving when "the store" would start giving out their samples. And, this recipe on this site was coming up on Google ahead of Martha Stewart's version the first two years! (Note: Printable "Adobe" Version available at the bottom of this page). * If you choose, you can use NON-STICK Parchment paper in place of the waxed paper to line your pan. If so, you won't need to butter the paper at all. 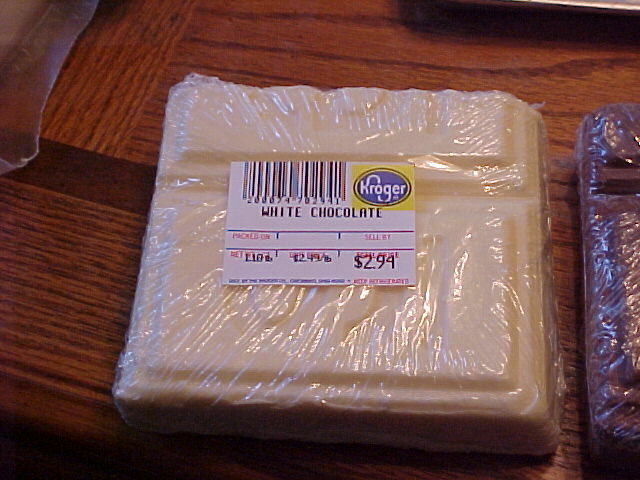 You can buy white and milk chocolate in big blocks at most supermarkets -- both of these are a little more than a pound each, but will work out just fine. (Note: chocolate chips may not produce the same result). Unwrap 9 of your peppermint sticks and put them in a large zip lock bag. 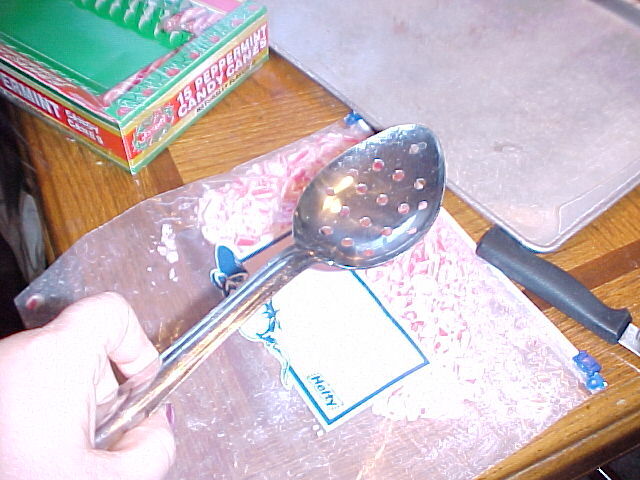 Beat them with a big spoon, hammer or something heavy until they're broken into bits. Put them in a bowl and set aside. The best way I found to melt the chocolate was to grate it in my Cuisinart and melt it on low temperature in the microwave for about two and a half minutes. At that point, all it needed was stirred to be creamy and spreadable. NOTE: Your microwave may cook at a higher temp. than mine so be sure you WATCH THIS CLOSELY, open the door and stir your chocolate often. 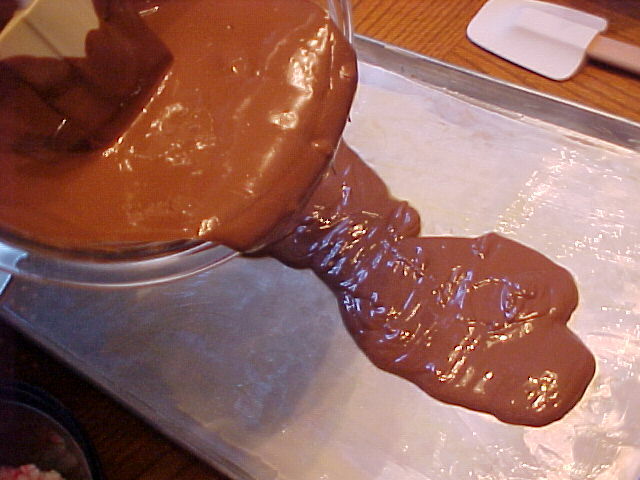 You can "make your own" double boiler if you'd rather not microwave the chocolate. 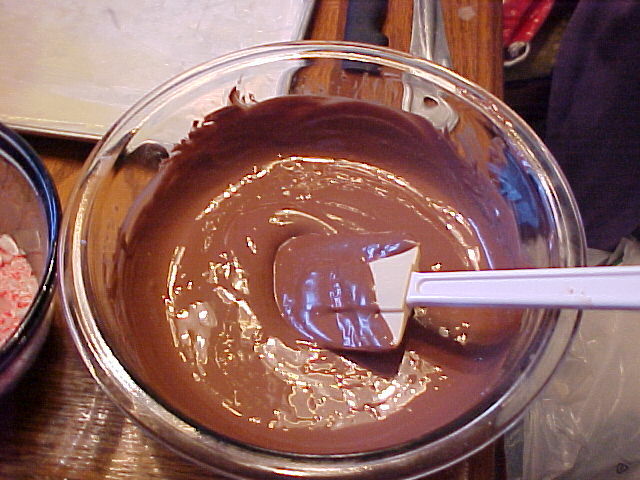 If you would prefer not to microwave the chocolate, you can use a double boiler. If you don't have one, look around in your kitchen. If you have a medium sized sauce pan and a heat-proof glass bowl that will fit on top of it, you DO have a double boiler and it will work just fine. One thing to be very aware of is that melting chocolate CANNOT have ANY contact with the water, whatsoever! So be very sure that no water splashes into the bowl of chocolate and I would even go a step farther and have an absorbent dish towel handy and wipe all traces of moisture off the bottom and sides of the bowl before you attempt to pour out the chocolate. Also don't cook it over water at a "rolling boil", just let the water simmer -- you don't want the water to boil up and splash. 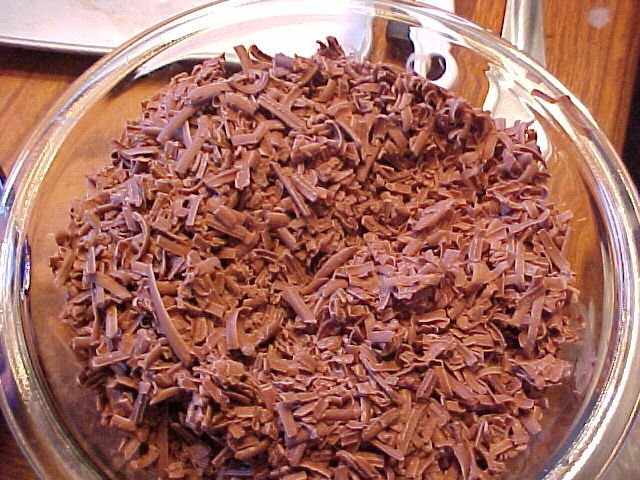 Chocolate that gets moisture in it will "seize" and be very unappealing. It will become grainy, firm up and be unusable. 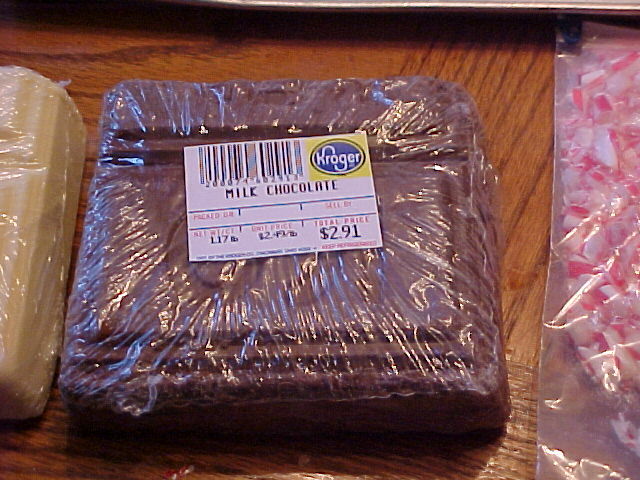 Therefore, it is important that everything you use is totally dry, that you don't overheat the chocolate. One warning I read even said not to use wooden spoons because they may hold a little moisture which could cause your chocolate to seize. 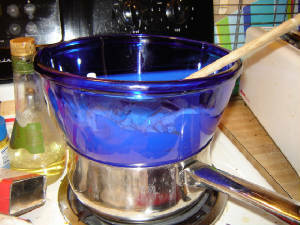 If you use the "double-boiler" method, be sure to keep stirring. 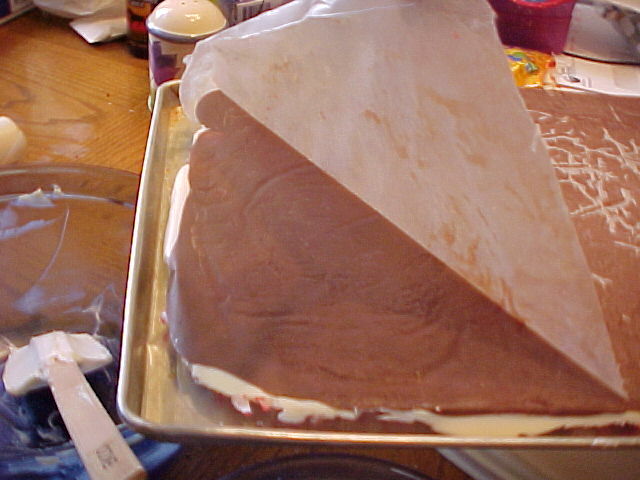 Line a 15" x 9" jelly roll pan or large cookie sheet with waxed paper and then butter the waxed paper. Alternatively you may use Non-Stick Parchment paper, UNGREASED to line your pan. 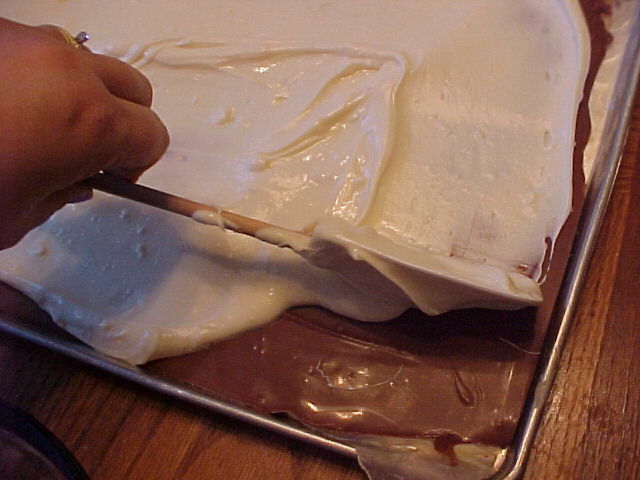 Pour your melted milk chocolate on the waxed paper and spread it out more or less evenly. 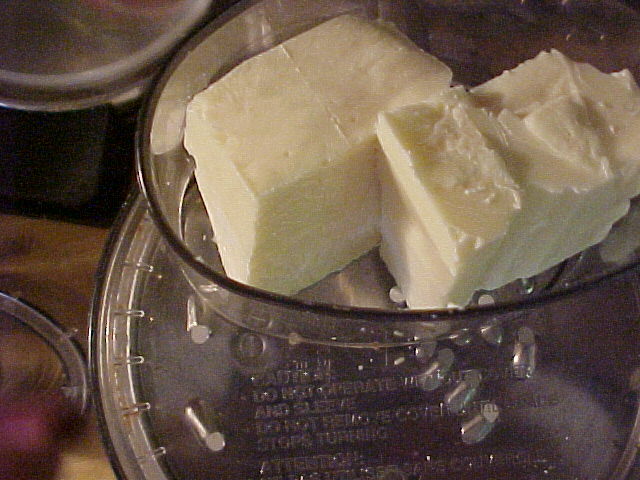 Place in refrigerator for about 15 minutes to allow it to set and harden. 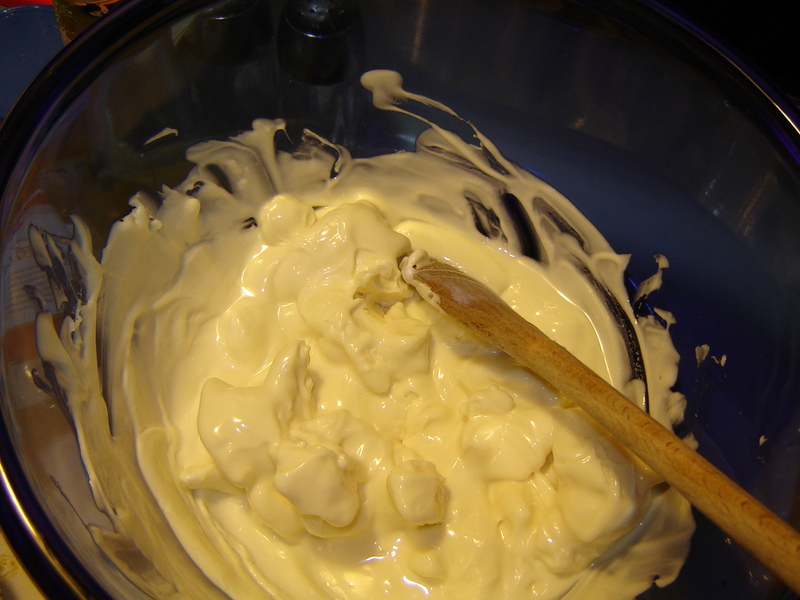 Pour melted white chocolate onto the cooled milk chocolate and spread evenly. It doesn't have to be 100% level or even -- close is good enough! 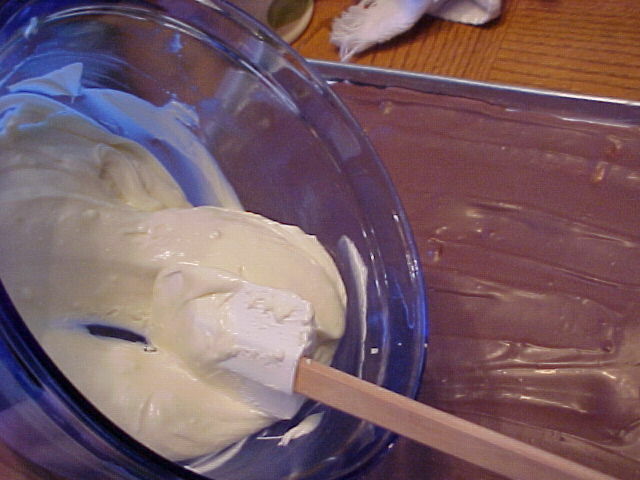 Sprinkle the crushed peppermint stick pieces all over the white chocolate while it's still warm and spreadable. 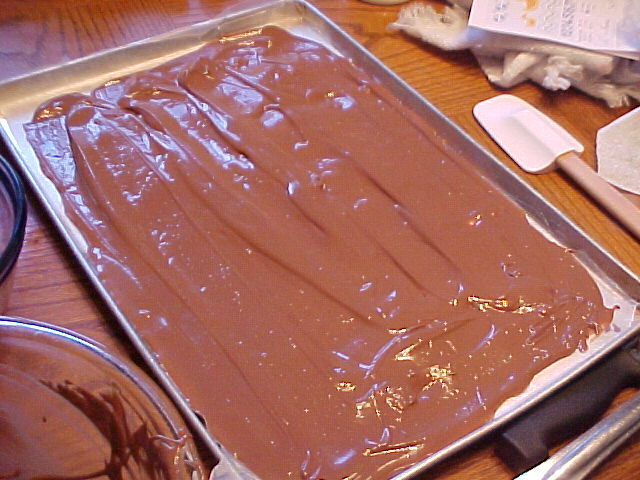 Place in refrigerator for 15-20 minutes until the bark is firm and cooled. Invert the cooled bark and peel the waxed paper off. Break into pieces. 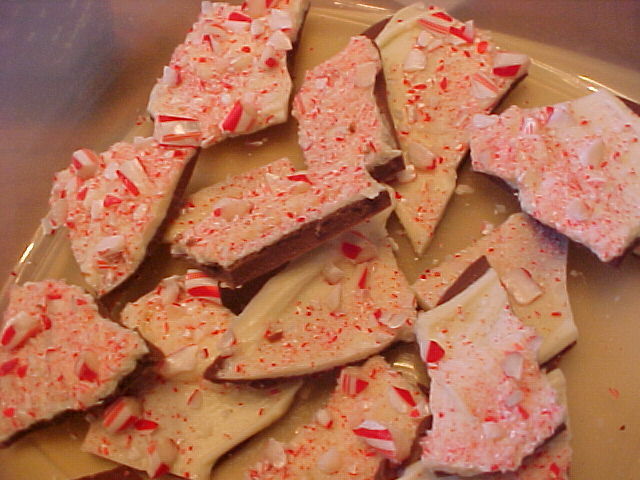 You'll lose some of your peppermint pieces, but that won't hurt a thing -- you can even dump the extra peppermint crumbs in with the bark to add flavor.